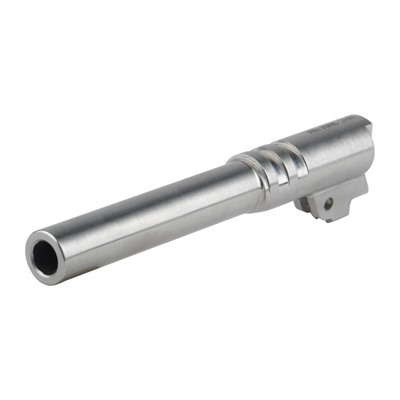 Features: Match Grade 1911 Stainless Steel Barrels Available in 9mm and 45 ACP Threaded barrels include thread protector Full fit match grade, gunsmith fit required Machined from 416 stainless steel 9mm barrels feature Wilson/Nowlin style ramp Threaded barrels feature .578x28 threads and a 5.755" OAL Mfg: Nighthawk Custom SPECS: Gunsmith fit required. Stainless steel construction. Threads - .578x28. Wilson/Nowlin ramp requires machining of frame.